Food Processors are multi-function electric kitchen appliances that can replace many other appliances and kitchen tools, and take the drudgery out of a variety of manual food-preparation chores. They are also one of the most expensive counter top appliances. Magimix is the big brand in France; Kenwood and Braun are the big brands in the UK. It’s true that Food Processors are not an essential item. Many people, though, would give up a lot of other things in their kitchens before they gave up their food processors. Just as many people, though, have them, and use them only rarely, reaching instead for a chef’s knife. Unless you know someone is asking for one or thinking of getting a Food Processor specifically, perhaps they are not necessarily a good present to get. Many get stored inside cupboards, and those stored inside cupboards tend never to be used. When buying a food processor, first consider whether you have counter space for it. If you don’t keep it on the counter, and don’t have a dishwasher to toss all the bits into for quick clean-up, you will likely end up as one of those people who never uses it. In the UK, it is very easy to get combo units that have both the standard food processing bowl, and a blender jug attached to it as well, making the appliance both a true blender and a true food processor. These are great space savers. If kitchen counter space is an issue, you may wish to consider a mini Food Processor. You might actually get more use out of one of these that lives on your counter, than out of a full-sized one that lives in your cupboard. They are, though, no less work to clean up than full-sized ones. Most Food Processors have on, off, and pulse settings. Some machines, in addition to the on button, have speeds as well to choose from once you have it on. Using the pulse button allows time for food to fall back down off the sides (or for you to push it off), allowing for more even consistency of what you are chopping. The base of the Food Processor houses the motor. It is the heaviest part of the machine because of this, but it also needs to be: it keeps the machine stable while in operation so that it doesn’t jump around the counter on you. Bases are available now in almost any kind of finish and colour to match various kitchen themes. A shaft comes up from the base into the middle of where the bowl sits. The bowl fits onto the top of this shaft. While it’s better to get a glass jug for blenders, all food processor bowls seem to come just in plastic. The bowl will have a lid, that will usually be made from the same material as the bowl. The lid will have an oval feeding tube in it that opens into the bowl beneath. This tube is used to feed items into the bowl while the machine is in operation. 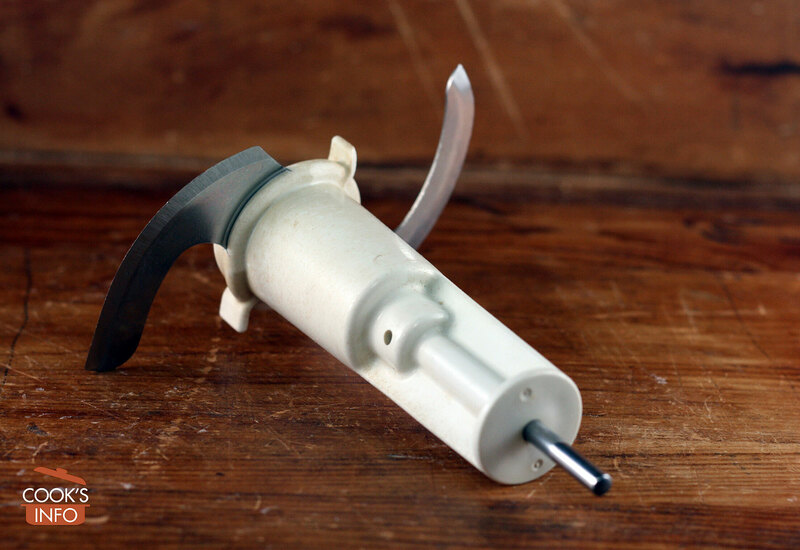 The feed tube has a plunger that is wider at the top of it, allowing it to rest in the tube and act as a lid. Some models have feed tubes with two channels in them, with one of the channels being narrower making it easier to get things like celery sticks, etc, to stay upright. Machines won’t operate for safety reasons until the bowl with its lid is latched properly into place. Some bowls are microwave safe. Some people like to order extra bowls so that in a mega cooking session, they don’t always have to be washing out the bowl. Larger bowls cost more money. Bowls come in different capacities, depending on the model of Food Processor (though some models may come with two separate bowls of different sizes.) Despite the advertised and apparent capacity of the bowl, expect it to be only able to process a fraction of that in practice. For instance, in an 11 cup bowl, don’t expect to be able to process more than 2 cups by volume of chopped fruit or veg at a time. Whatever you do, don’t fill your bowl to its capacity with liquid. During processing, the liquid will come out of the edge under the lid. The blades that perform the actual processing operations fit over the shaft coming up into the bowl. Three blades are common to all food processor: an “S blade”, plus one for shredding and one for slicing. In the UK, Food Processors are more likely to come with a dough blade as well as the standard three (in North America, the dough blade is usually an option you have to purchase.) You can usually order, from the manufacturer, slicing and shredding blades with different degrees of coarseness or fineness, if you wish, Most also come with a whisk attachment. The blades designed to be at the bottom really need to be right at the bottom. In some less desirable models, they will actually be some distance above the bottom, with the result that the blade will just spin above ingredients that it’s meant to be making contact with. Blades will lose their sharpness over time, and need to be sharpened or replaced. S Blade It’s easy to spot the S blade, because it’s shaped like an “S” with two curved blades on either side of its central post. And it’s easy to remember what it’s called, because the “S” is also short for “Sabatier”, the French knife maker who makes the blades for the French Magimix models. The S blade is almost always made out of metal, which is preferable for its sharpness, though occasionally you will see these in plastic. These blades are designed to work at the bottom of the bowl. When the machine is on pulse, the blade will chop. When the machine is actually on, it will purée. Shredding Blade The shredding blade is designed to sit at the top of the bowl. The blade acts upon food as it enters the bowl from the feeding shaft. Food falls into the bowl after it has been “processed.” Use it with the machine on pulse for shredding cheese, and for shredding cabbage for coleslaw. Slicing Blade The slicing blade is designed to sit at the top of the bowl. The blade acts upon food as it enters the bowl from the feeding shaft. food falls into bowl after it has been “processed.” You use this blade for uniform, thin slices of potato and apple, cucumber, cabbage. Actual operation, though, can be tricky because as you drop the food items into the chute, they can end up at odd angles or even blocking each other from going down further. You’re best to pack the items neatly into the chute before you turn the machine on. Dough Blade The dough attachment is a blade like the S blade rather than a disc, but it’s far less curved, and normally plastic. Some models, even though they might come with a dough blade, might not be heavy enough to knead certain doughs without dancing all over your countertop. Don’t try to make dough unless your food processor also has a speed regulator, otherwise it will rotate too quickly, heating up the dough. Dough often rides up the shaft. Egg Whip Blade An Egg Whip Blade is a blade with two straight arms, with paddles at each end. Use it for egg whites and whipped cream. Julienne Disc For making matchsticks from vegetables. It has sharp teeth that stick out from the disc a short distance. French Fry Disc This disc is the same idea as the julienne, but it’s designed to yield the fatter pieces needed for French fries. Citrus Juicer The Citrus Juicer is a dome-shaped attachment sits on top of the bowl. It is designed, as the name suggests, to juice citrus fruits. Juicer The juicer attachment is used for making juice from items other than citrus fruit. You feed the pieces of fruit or veg through the feed tube. This device purées the pieces, collects the pulp in the middle, and lets the juice fall to the bottom of the bowl. good for shredding fresh coconut, parmesan cheese. soups can be done only if you want the soup to have a texture coarser than what you would get in a blender, and only if you process it a little at a time (if you process too much at a time, the soup will come out from the joint between the lid and the bowl. the blades can quickly toss small, light items such as garlic to the sides of the bowl. You need to either turn off the machine, unlatch the bowl, remove the lid and push it down, or if your recipe is using some kind of liquid (for instance, oil, juice, water or wine), add some of the liquid which will help both keep the garlic on the bottom and help the garlic which does get tossed on the sides to dribble down more quickly. Will you use one regularly? Do you have counter space for it? ones that are stored away tend to stay stored away, and never get used. What size of bowl do you need on it? e.g. do you ever cook in large quantities, either for freezing or for crowds? Do you need any special discs? Do you want a combo unit that has both a food processor bowl and a blender jug on it? Are all the parts (except the base, obviously) dishwasher safe? Check how many years the motor warranty is good for. If you have to send the Food Processor to the company for repair, do they cover shipping both ways? Consider bundling all the attachment bits together in one or two heavy duty sealable plastic bags so that you always know where they are, rather than having them loose in drawers. You will find them easier and they will stay dust and grime free. As well, the blades are so sharp, you probably don’t want them surprising you while you are fishing at the back of a drawer for something else. Despite the blades being sharp, they will actually store well inside a heavy duty plastic bag. Some date Food Processors back to a device manufactured in 1919 by an American firm called Universal Co. The first kitchen appliance close to what we would now call a Food Processor now was introduced to the market in 1950 by Kenneth Wood (4 October 1916 – 19 October 1997), an English inventor and owner of the Kenwood company. The machine was called the Kenwood Chef A700. The heart of it was a regular stand food mixer with a bowl and beaters, with a heavy-duty motor, capable of juicing, puréeing, and even kneading bread dough. Competitors’ models did the same, but the Kenwood model leapt ahead of them by having three outlets in various places on the machine. You could purchase additional attachments to fit into these outlets which then allowed the machine to slice, mince, shred, peel potatoes and open cans. Despite the persistence of post-war depression in English, and despite the machine’s price tag of 19 pounds (equivalent to 450 pounds in 2006 money), the machines sold like hot cakes. In 1963, a French cook and inventor, Pierre Verdun, created an appliance he called the “Robot-coup.” It was a drum with a blade in it, aimed at professional kitchens. The blade rotated inside the drum. By 1971, he had created smaller units aimed at home kitchens. He called the home model “Magimix”. It had 3 functions: Start, Stop and Pulse. In 1971, a man named Carl G. Sontheimer from Connecticut, aged 57 at the time, saw Verdun’s model at a food show. Carl was born in New York in 1914, and a graduate from Massachusetts Institute of Technology (MIT). He had had his own electronics company, which he’d sold, and had worked on a microwave direction finder for NASA. At the time of his seeing Verdun’s Magimix, Carl was retired and on a trip to France with his wife, Shirley. His love of cooking had brought them to the food exhibition. Carl was so taken by the Magimix that, even though he was retired, he was inspired on the spot. He bought distribution rights for America, and took a dozen of the machines home. He analysed what it did well and did poorly, and did modifications, and he and his wife tested out his modifications in their kitchen. He made up a new name for it that both sounded French and summed up the machine: he combined the words “cuisine” (“cooking”) and “art”. He first displayed it at the National Housewares Exposition in Chicago in 1973. Only after the Cuisinart line had taken off in America did Magimix really take off in France. Cuisinart was expensive at first. Its price was $140 US, and that was back in 1973. Some people thought it was just a fad appliance. To promote it, Carl showed it to food celebrities such as Julia Child, Craig Claiborne, Jacques Pépin and James Beard. In March 1975, it got a good review in the New York Times, and again in Gourmet magazine in April 1975. By 1976, it was flying off store shelves for Christmas, and Mother’s Day 1977 in New York City saw phenomenal sales of 1/2 million units. By 1977, there were over 12 competing brands. The Cuisinart company was sold in 1988 for $42 million to a group of investors, who a year later in late 1989 sold it in turn to the Conair group, which still owns it today (2005). In 1993, Cuisinart began making other kitchen appliances under its brand name. According to Julia Child, the food processor was one of the two tools (the other, she said, was the food mixer) that most revolutionized work in the kitchen in all of the 1900s. This is debatable, considering that the century also brought along not only electric refrigerators, but also instant-on ovens that didn’t require you to chop wood or shovel coal first, and sinks that didn’t require buckets of water brought in from outdoors. The pulse button was a later addition to Food Processors. Before it, food in them frequently got over-processed. Carl Sontheimer died March 1998 at age of 83, having come out of retirement to make his real mark on American homes. In some of the first models, locking the bowl into position would also turn the machine on, but all newer ones since then have on / off switches. ran out of space to attach this in normal spots. attached here and hidden from web. Levy, Paul. Obituary: Kenneth Wood. London: The Independent. 24 October 1997. Nelson, Rick. 10 appliances that shook the world. Star Tribune. 17 April 2002.